Tuberculosis is a disease that is caused by a bacterial infection. This bacterium is spread through the air; so this means it is infectious. The bacteria will infect persons if they live with an infected person or work in an environment where there is an infected person. The disease is spread by the infected person who coughs or sneezes without any caution. Persons who have tuberculosis need to be careful when coughing or sneezing, by covering their mouth and nose so as not to expel any particles. This is what gets into the environment and other persons inhale and contract the disease. On becoming infected by these bacteria, it will invade the bloodstream, then into the lymph nodes and spreads to any other organs in the body. This bacterium is generally found in the lung when detected. Tuberculosis commonly known as TB is classified in two stages; the active stage and the inactive stage. 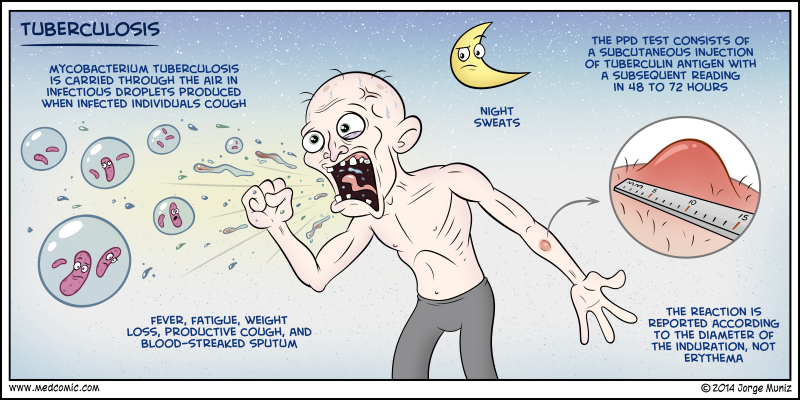 In the inactive stage of tuberculosis or latent tuberculosis; means it will be in the body and stays dormant. There are no signs that the individual has the disease, and it is not in an infectious state. Persons will live for long periods without having any symptoms. This does not mean they ought to stay with the bacteria in their bodies; they need to get medical treatment to rid their bodies of these deadly bacteria. Tuberculosis is generally treated with antibiotics. An inactive stage of tuberculosis can become active if the immune system is compromised, if the person contracts HIV or if the person is elderly, babies and or children. These individuals will become susceptible to the disease becoming active. When the bacteria become active it will cause death to the tissues or organs which are infected. 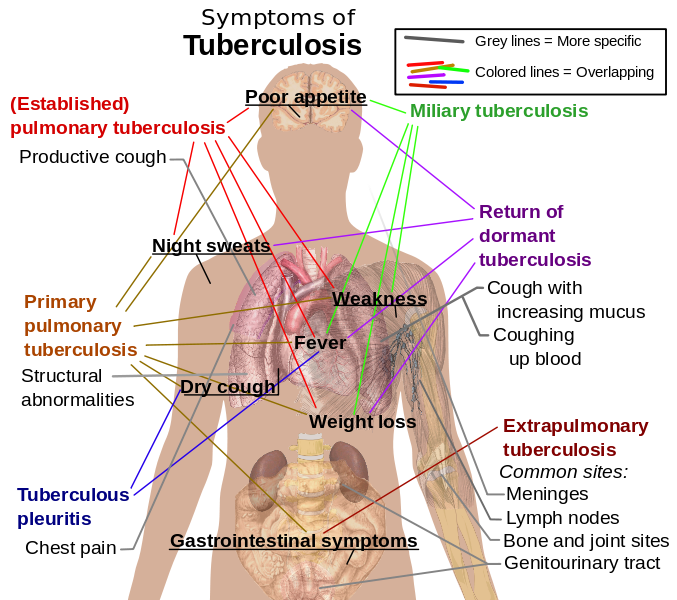 Active tuberculosis is when the bacteria in the body actively invaded the organs; namely the lung. This state occurs when the body’s immune system is low and it is unable to fight the bacteria so the lungs become infected. The symptoms of active tuberculosis are coughing up blood, a terrible cough and chest pains. For persons who have developed active tuberculosis, the bacteria will infect the lung in such a way as to even cause a rupture or tear in the lung. Tuberculosis once diagnosed can be treated with antibiotics effectively. This was discovered in the early 1950s. This is not so easy now as the bacteria have become immune to the treatment of antibiotic. A new and more stubborn strain of the disease has surfaced which is classified as multi-drug resistant TB or drug resistant TB. Because of this new development and the resistance of the bacteria to the commonly used drugs it has become more difficult to treat. This status is become a problem worldwide and has kept the medical fraternity on their toes where treatment is concerned. Knowing your status is important and if you believe you have contracted this deadly bacterial tuberculosis; you need to seek medical attention immediately.